Network Router Tests - How to Test Your Router? Network Router Tests – How to Test Your Router? Microsoft offers the Internet Connectivity Evaluation Tool, which tests your network router to find out whether it will support specific technologies. The tests may can be performed on a computer running Windows XP or Vista with Internet Explorer 6 or later, and may take up to ten minutes to run. To test your router with the Internet Connectivity Evaluation Tool, make sure you are logged into the computer as an administrator and then go to the Internet Connectivity Evaluation Tool website. If you agree to the terms and conditions, select the I have read and ACCEPT the terms of the License Agreement checkbox and click Continue. You may be prompted to install the ActiveX control, as well. 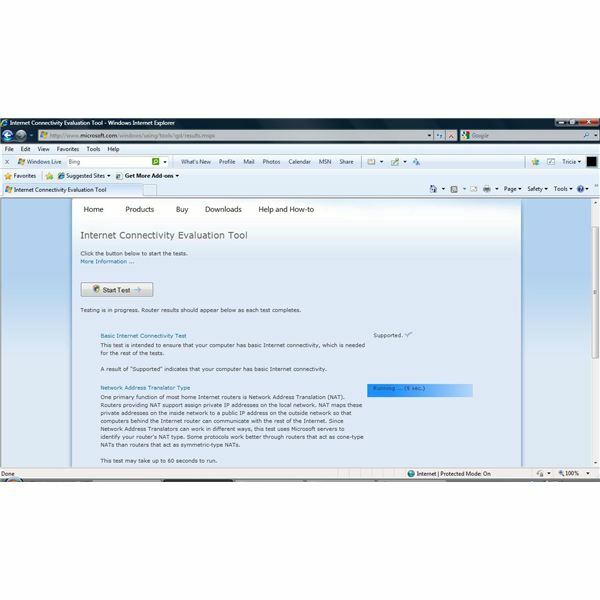 Click the Start Test button and wait as the Internet Connectivity Evaluation Tool tests your network router. You can watch the results as the test is performed. The Internet Connectivity Evaluation Tool tests basic Internet connectivity, network address translator type and more. DSLReports.com offers several speed tests for a network router. The Flash 8 plug-in based speed test, which tests network routers using residential broadband, such as DSL or cable, for download and upload speeds. To perform this test, click the link and then select a city from the server list. 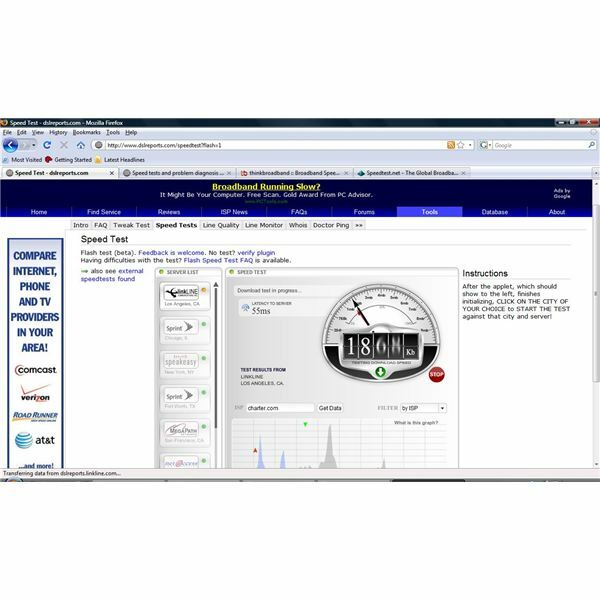 The tests are shown using a speedometer-like animation, and when the tests are complete, you can compare the results to see how your network router tested. 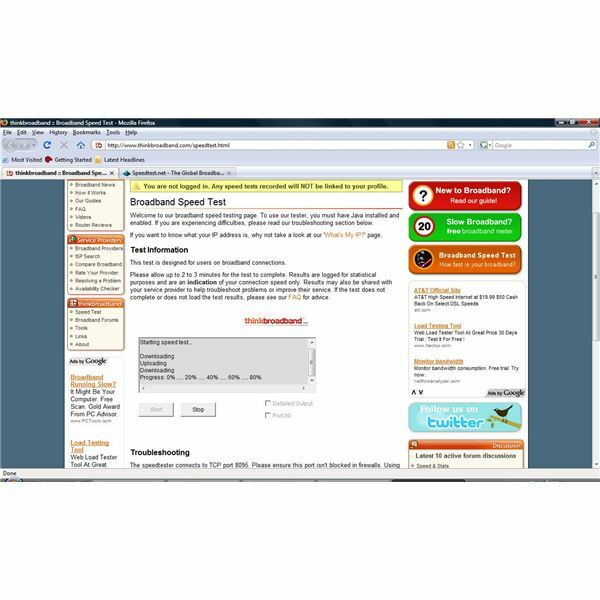 Another network router speed test is available at ThinkBroadband.com. Make sure your computer has Java installed and enabled, follow the link to the test and click the Start button. You will be instructed not to use your network connection while the upload and download tests are being performed. These network router tests will only take several seconds to complete. Once the tests are done, you will be automatically taken to a brief form that asks for your ISP, postal code and phone number. If you live in the UK, you can choose your ISP from the drop down list. Otherwise, simply click the I Live Outside the UK button and you will be shown your network router test results. For more helpful tips on creating a network and using a router, check out How To Diagram Home Networks, Is Somebody Stealing your Wireless Connection? and How to Set Up a Vista PC on a WiFi Network with XP Computers.